Withstanding the Test of Time – Corporate Giveaways Buyers’ Show 2013 - Hello! Welcome to my blog! The country’s leading business gifts expo celebrates its 26th year ! Looking for Business Gifts, Promotional Ideas, Premium items & other Merchandise Incentives? You're in luck! 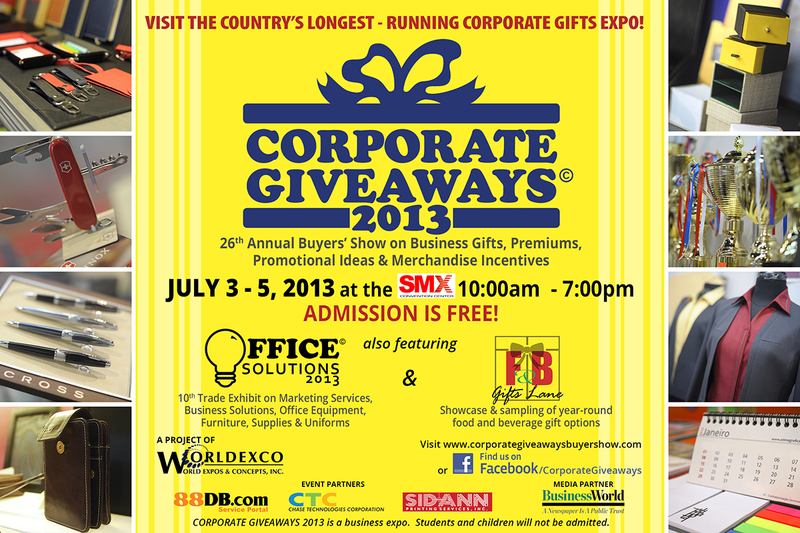 Corporate Giveaways Buyers’ Show 2013 is just around the corner. It is an annual fete that has been gathering a specialized group of exhibitors under one roof, for 26 years in a row. A lengthy title isn’t all the Corporate Giveaways has under its belt, there’s also a whopping two decades in the industry and a heritage built from hands-on experience. The idea for the event started when Worldexco Chairman,Lynn Romero was the PR director of one of country’s leading hotels. She needed to find a ready and reliable source of specialized gifts for the hotel’s clients and partners. What began as a personal quest eventually turned into a wonderful solution for marketing professionals who were experiencing the same dilemma. In addition to a sure ticket to profit, visitors of the Corporate Giveaways Buyers’ Show also receive the guarantee of quality from this mix of manufacturers, traders, and importers. Aside from a core group of exhibitors, including Manel’sLeathergoods, Star Paper, Tieline, Memo King, and others, the expo also features newcomers obtained through a referral system, filtered through rigorous criteria before they make the cut. Selection hinges on the quality of goods and the legitimacy of their corporate gift business. Given the screening process for exhibitors, the people running the show take things very seriously indeed. With no frills, raffles, retail selling or stage shows of any kind,Corporate Giveaways hinges on a straight up view-and-order routine, ideal for serious purchasing executives. But for people who mean business, nothing’s better than getting a sure shot at great returns. The 26thCorporate Giveaways Annual Buyers’ Show on Business Gifts, Premiums, Promotional Ideas & Merchandise Incentives will take place from July 3-5, 2013, at the SMX Convention Center, Seashell Lane, Mall of Asia Complex, Pasay City. Check out the list of exhibitors below. Presentation is half the work with gift-giving, and Basketcase recognizes this fact. Creating Gift Baskets to suit every occasion, they accept customizations according to budget, theme, color, and more. Members of the industry since 1997, this enterprise offers creativity and sentiment all at once. CaL Print Works is a one-stop innovative solutions provider for customized tokens and giveaways. The company offers printing and embroidery options on a wide variety of items, including USB flashdrives, bags, pens, mugs, and shirts. Their dedication to giving the customer exactly what he wants extends to 24-hour service, seven days a week. For projects that require both quality and punctuality, CaL Print Works is among the best the country has to offer. Here’s one company that takes paper pushing to a whole new level. As specialists in providing printed collaterals, Calliope Printing focuses on a three-fold vision for all clients. With a commitment to quality, excellence, and value, their quick, reliable services make office work a breeze. In the 15 years since its founding, CDC Advertising Tools, Inc. has grown to be one of the Philippines’ top suppliers of corporate communication products. CDC lets customers imprint their brand onto an impressive array of gifts and novelties, such as shirts, computer accessories, jackets, car accessories, and other imported goods. Backed by a decade and a half of specialty advertising experience, the company helps its clients maximize project awareness and branding efforts through timely, high-quality, and value-for-money service. With a history spanning 75 years and three generations, Cioccolato Sublime, Inc. has been crafting some of the finest Italian chocolates available. The family-run business is currently in the masterful hands of chocolatier Enrico Nazzareno, bringing his grandfather’s legacy into modern times. Each sumptuous piece is a welcome gift for any chocolate lover, with unmatched quality and flavor radiating throughout every bite. Creative Retail Storage Solutions Corp. The weight of the world is a lot easier with Creative Retail Storage Solutions Corp.’s products. A wide variety of cases carry all your daily essentials, with keenly colored wallets, money clips, card cases, and makeup kits. Items like bag hangers, bedside caddies, and jewelry organizers help keep everything else nice and tidy. With gifts and giveaways as useful as these, your clients are guaranteed to thank you. As one of the country’s top choices for direct marketing solutions, Cristanelle Int’l Inc. provides clients with customized corporate gifts and promotional products. With a commitment to helping companies achieve profits, productivity, and performance through their selection of goods, Cristanelle’s services guarantee success. Clients can choose from a wide range of items, including USB flashdrives and speakers, calculators, pens, t-shirts, and keychains, to be delivered within three to five days for maximum efficiency and satisfaction. Since 1999, Graficad Creation, Inc. has supplied its clients with a slew of top-class products for both branding and internal communications. Having started mainly in creating cost-effective sign solutions for any purpose, the company has grown to be a full-service creative products provider. Graficad now offers printing on multiple gift items, such as mugs, mouse pads, sports bottles, shirts, and stickers. Customized trophies, balloons, and other souvenirs are also available, alongside the company’s layout and design services. With over 22 years of experience worldwide, Grassroots by Craftmill has been producing some of the finest eco-friendly décor and storage solutions in the global market. With indigenous materials being crafted into storage boxes, frames, and accents, each product bears unique, memorable characteristics. Grassroots also offers office desk items and stationery as gifts and giveaways for your valued clients. While specializing in garments, bags, and eco-friendly options, Green Ads &Promats, Inc. is also a leading source of other marketing supplies like creative USB flashdrives and tumblers. The company customizes each item to its clients’ specific branding needs, maximizing both brand recall and goodwill to recipients. The next time you want your company to be represented with creativity, flair, and convenience, remember to think Green. Grimalkin Corp. is a proud distributor of Victorinox products. As the manufacturer of the famed Swiss Army Knife, Victorinox creates some of the world’s most popular promotional items. Their multi-function tools come in an array of shapes and sizes, from the famous pocket knives to the ingenious Cyber Tools, offering flexibility in your promotional solutions. With over a decade of experience in the industry, Ismarte has provided numerous companies with wearable options in high accordance with customer specifications. Their focused commitment and continued search for innovation mark them as certified experts in their field. For Langhoff Promotion Philippines, products are more than just giveaways – they’re “talk-togethers.” With a focus on generating promotional items that get people talking about your brand, Langhoff’s array of customized gift and novelty items ensure the kind of market engagement you need. Products range from office staples such as pens and USB flashdrives to fun goodies like beach balls. A range of exclusive gifts from prestigious imported brands such as Nina Ricci and Cerrutti 1881 make your clients feel like the VIPs they are. Manel’s has become synonymous with high-quality leather products from the Philippines. As one of the country’s leading leather supplies provider, the company is known for its top-notch shoes, wallets, and leather accessories. A gift from Manel’s is a sophisticated gesture of goodwill to every recipient, making them feel just how valuable they are to your company. Newtrends International Corp. recognizes that memories matter. Being one of the leading distributors in the Philippines, they bring in premiere brands that prioritize excellence in superior craftsmanship. As purveyors of high quality personalized time pieces; they certainly realize that all great gifts are timeless. Having been in the industry since 1988, Oriental Merchants Inc., has discovered many ways to tickle the taste buds. Gift hampers laden with olives, specialty cheeses, pasta, and spices are only some of the mouthwatering delicacies on offer. Personal care is also the company’s expertise with many brand options for cologne, soap, shampoo, and fresheners. 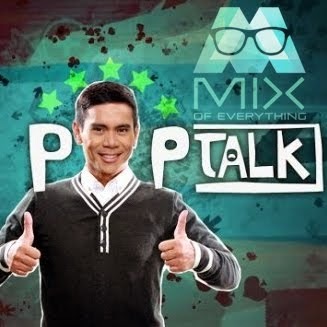 Over the years, the Primer Group of Companies has repeatedly brought exceptional brands to Philippine shores. Offering the best in travel gear, they continue to push the bar when it comes to providing sleek styles with exceptional construction. Victorinox, Mendoza, Eagle Creek and World Traveller are only some of the prestigious brands under their belt. Variety is a Purple Tag specialty and one they continue to expand on. Interested parties can select from numerous avenues in corporate gift giving. From water bottles to pens and even gourmet coffee, there’s something for every occasion under the sun. Sidann Printing Services Inc. specializes in various Commercial and Social Printing products. Calling cards, brochures, postcards, and posters are only some of the items made available by the company. Special services such as typesetting, color separation, and large format printing help clients cut time on similar in-office procedures. On days when best impressions make a difference, nothing seals the deal quite like a dapper tie. Tieline, Inc. specializes in adding the finishing touch to work wear with a little dash of personality to top things off. Perfect for gifts, souvenirs, or uniforms, their wide selection of ties, cufflinks, scarves, and other accessories maximizes the fashion side of business. Touch Tab by Office Man Inc.
Touch Tab is the creator of Sticky Notes, a great way to cost-effectively highlight your brand with distinction. Customizable sizes and designs make their much-coveted products perennial best sellers, at the top of any marketing professional’s to-order list. Marian is FHM's sexiest woman of 2013! Jack Reacher out now on Blu-ray, DVD and VCD. [Movies] "The Counselor" Teaser Trailer. Crimson Hotel Photo Caption Contest. Fall in love again in "Before Midnight"
Despicable Me 2 - The Minions are back! Latest poster from "300: Rise of An Empire"
UNIQLO opens at SM Fairview tomorrow! My relaxing and pampered afternoon at Posh Nails.